Accent colors are a hedge against boredom and let you play with even the most sober decor. Use a contrasting color for drapes, throw pillows, decorative items such as vases, the flowers that go in the vases, an area rug or a single, glossy primary-color chair in a room. Change accent colors seasonally in a neutral room that shifts personality with pale spring pillows, sunny summer wall hangings, rich harvest gourds and pumpkins, traditional holiday green-and-red wreaths, and sparkly winter crystal candlesticks on the mantel. 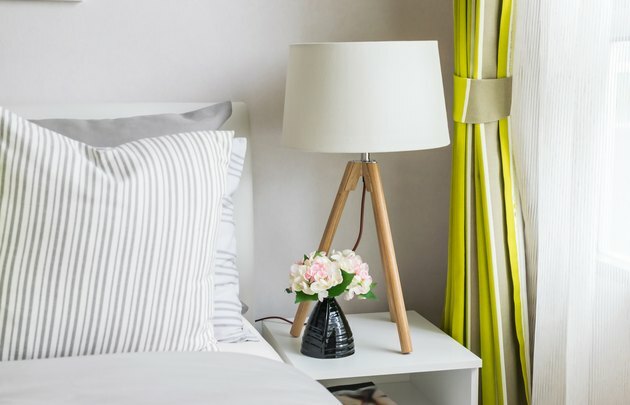 A white and plae gray bedroom with lime green drapes. A monochromatic color scheme uses all one hue, in various intensities, for the decor in the room. Playing with color saturation or intensity creates an accent without adding a new color. In a mint-walled room with a pale green tweed sofa and muted olive club chairs, add a couple of emerald or lime throw pillows to shake things up a bit. When the paint on the walls is neutral linen, the floor is polished natural wood, the upholstery is a mix of canvas and unbleached linen, and the pendant shades are white paper, park a tobacco-leather butterfly chair next to a clear acrylic coffee table or toss a brown-and-white faux zebra skin on the floor. Paint one entire wall a deeper shade of the dominant wall color -- a rose accent wall in a blush room. Use accent color with the mastery of a film director to draw the eye to a music alcove or into an adjacent room. A deep accent wall in the dining room, visible through the archway from the living room, frames your Mid-Century Modern table and chairs like a matte around a painting. A white-hued living room and dining room, with the far wall of the dining room painted deep teal, is an attention-grabber that highlights your Saarinen tulip set. A cinnabar wall in the library, visible through open pocket doors from the living room, displays a framed oil painting to advantage from the hall and living room. Pull a forest green from the painting to cover the velvet club chairs in the library, an additional accent that mirrors the featured art work and complements the accent wall color. You can mix your own chalkboard paint to match or contrast with the decor in a room. Find a rich color for a kid's room or the hallway wall outside it, add a narrow chair rail to one wall and paint "wainscoting" in custom-color chalkboard paint for an instant invitation to original art. Try rust in a blue bedroom, olive in a pink playroom, deep lavender in a cheerful yellow nursery or traditional classroom-chalkboard-black in a light gray hallway. Use lighter chalkboard paint -- mint in a white kitchen, apricot in a turquoise mudroom -- with brightly colored chalks. The painted surface is an accent itself, which doubles its impact when the talented residents of your atelier chalk their finest quotes and cartoons all over it. The red-orange in your prized Rauschenberg "Bicycle" print always cheers you up but you can't imagine living with an entire room of it. Break up the studied minimalism of your all-white or dove-gray living room with a couple of sofa pillows or a glazed hand-thrown bowl to match the vibrant color in the framed poster on the wall. Pick a hot pink yarn in the multi-colored woven throw and mirror it in an overdyed rug for the conversation area or in leather upholstery on a single chair. Hang the preserved and mounted marlin your grandfather bagged off Cuba with Hemingway -- according to family legend -- on the pale yellow dining room wall. Then hunt for the exact shade of Gulf Stream electric blue that shimmers off the fish for the canvas Roman shades on the windows. Use a snippet of color from what you love to invigorate your decor and emphasize your marquee collectible or art work.